TFI Envision is a Health + Wellness Design Awards 2018 Winner! | TFI Envision, Inc.
TFI Envision is a Health + Wellness Design Awards 2018 Winner! Home / Archive / The News / TFI Envision is a Health + Wellness Design Awards 2018 Winner! New York, NY — For 55 years, Graphic Design USA has sponsored competitions that spotlight areas of excellence and opportunity. GDUSA’s Health + Wellness Design Awards competition honors the best of graphic design and marketing in one of the fastest-growing segments of the economy, and encompasses broadly the traditional medical and healthcare industries, healthy lifestyles and nutrition, and public health and sustainability initiatives. 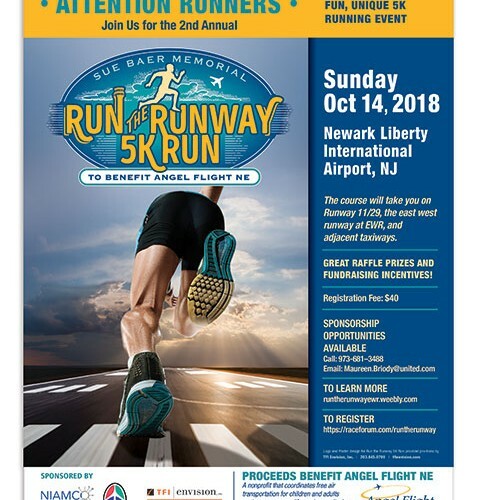 We’re thrilled to have won a Health + Wellness Design Award for the poster TFI Envision developed for Angel Flight NE’s “Sue Baer Memorial Run the Runway 5k Run”. The event is being held on the runway at Newark International Airport, so the goal of the poster was to capture the ‘sense of place’, excitement and energy in the creative execution of the poster. Challenged by an extremely long name, TFI Envision’s creative team used different typefaces, type sizes and kearning to help the viewer ‘read’ the logo, using the largest type to grab the most attention, with the supporting text smaller. The image created for the poster brings the viewer right onto the runway as the runner takes off into the sunrise. “The proceeds of this event will be going to Angel Flight NE, the nonprofit that coordinates free air transportation for children and adults so they can access life-saving medical care. 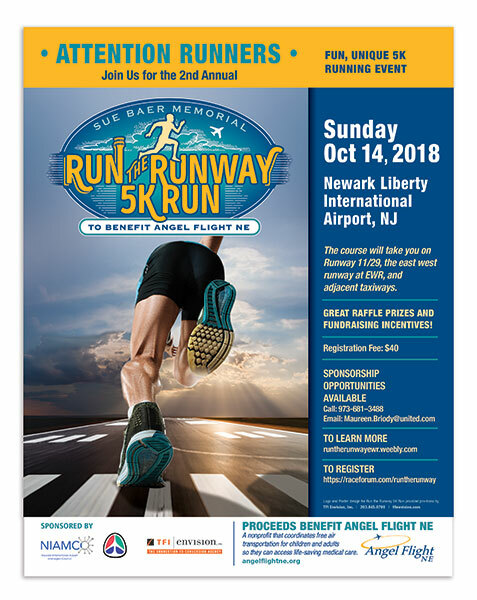 We are proud to support Angel Flight NE and hope that the runway will be filled with runners and walkers this year!” said Mary Ellen Butkus, Vice President of TFI Envision, Inc.
Register Today to Run the Runway! You can run or walk!